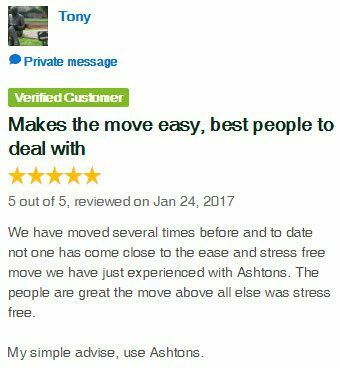 Ashtons Removals’ receive overwhelming positive feedback from their customers, including on independent review websites we have no control over, like our listing on Product Review. 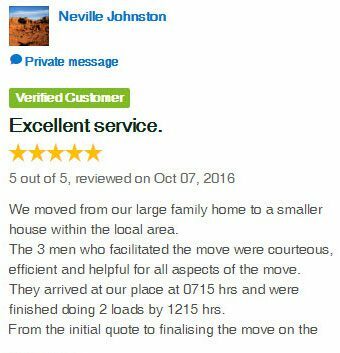 For client comments provided on our after-the-move feedback form, please see below. Absolutely faultless service from admin to the removal team. As good as I have ever worked with. The team were great – nothing too much trouble. Great team – nothing a problem. Very hot day, they worked very hard. Well done to your team. 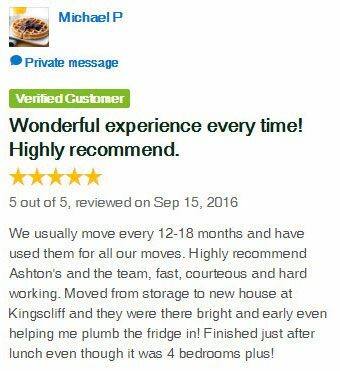 We’ve used Ashtons three times and each time their service has been great. Thank you for being such great guys on the day of my move. It was very, very hot. Their humour helped me through a very difficult time and move. Cheers to your team. The move went smoothly – the men were all helpful and pleasant. Thank you to all. The boys were exceptional. I moved under very difficult circumstances. Their professionalism, courtesy and kindness made it manageable. Thank you. The boys did an amazing job moving my grandparents, they were so helpful, courteous and had so much respect for them. They made what would of been a stressful day an easy one. We have bought & sold 14 homes in 33 years, undoubtedly the best experience with a move we have ever had, our team was brilliant. These guys were great – took so much care, very friendly and good fun. 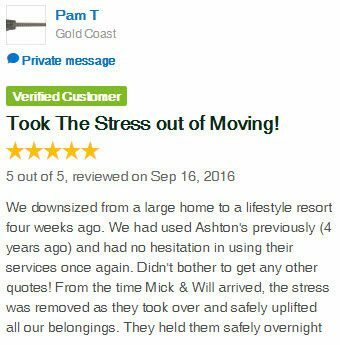 They took the stress out of us moving. Fantastic service! Very efficient from the start. The staff in the office were professional and helpful. The removalists were excellent. I am very impressed with your service. Nothing was broken and everything went very well. The removal team were excellent. They were very obliging, very careful and pleasant. Really good service. The removal team were fantastic – couldn’t have worked harder in very difficult conditions. Thank you. Your team was punctual, polite and professional. Thank you. I can’t speak highly enough of Ashtons. 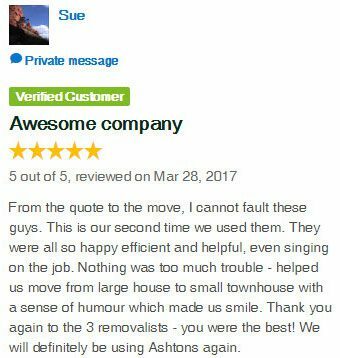 Thank you for making the move of a grand piano worry free. 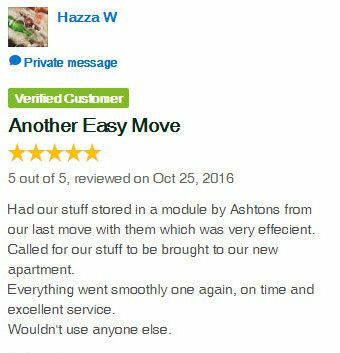 I have used Ashtons for my last 2 moves, and am very pleased with the service provided. Very efficient. The boys were pleasant and careful. Couldn’t be happier with the move. Nothing was damaged and the guys on the day couldn’t be more helpful. I would like to express my thanks for the very professional and helpful way your team of Mick, Joe, Shaun and Doug loaded and then unpacked in the move to Queensland. Nothing was too hard. Once again a big thank you to you and your company, especially to the awesome four. Extremely happy with the service, competitive pricing and the communication involved. Thank you. Both men were excellent – couldn’t have been more helpful. Would recommend them any time. Overall I was very impressed. 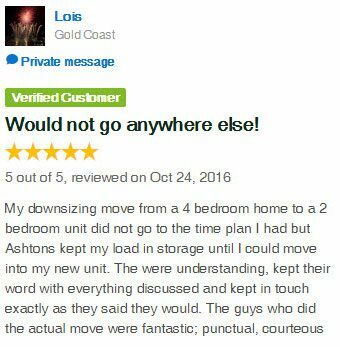 Really happy and knew going with Ashtons would be stress free. Well done team and thank you again. I cannot recommend Ashtons more highly. Professional approach, helpfulness and courtesies were of the highest standard I have ever encountered. The service was outstanding in every way. We were particularly impressed with our removal team. They were helpful and polite. 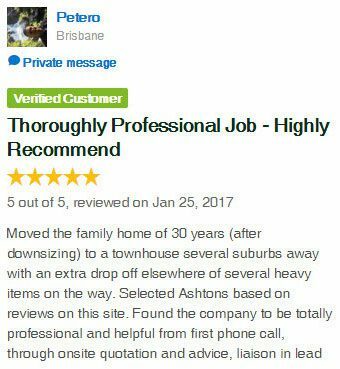 Our overall removal was excellent. Your organisation shines. Keep up the good work. Very good in every way. Very pleased. Would recommend your company to everyone. 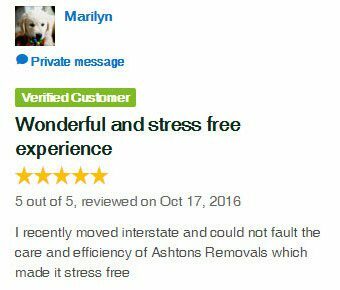 Great work, we are so happy we went with Ashtons Removals. Very courteous, friendly and careful service from your men. Thank you. We were impressed with the care taken by [names removed]. They were very friendly, polite and took care with the move. They placed heavy furniture in position and moved it when I thought it looked better on another wall. I had the usual stress of moving and Ashtons was aware of that… I thank you all very much. It was a pleasure. We could not fault the professionalism, friendly, helpful, hardworking group of young men who assisted us yesterday. 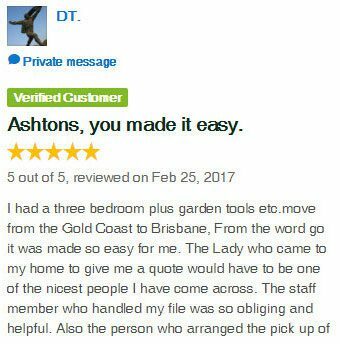 I would definitely recommend and use Ashtons again. We cannot fault your service in any way. You all went above and beyond during unforeseen delays. We are very appreciative. Your staff…[names removed] all showed exceptional professionalism, friendliness, care and help throughout the whole procedure. 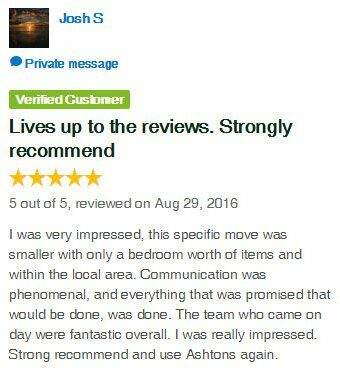 I would not hesitate to use Ashtons Removals again and highly recommend your service to our friends. 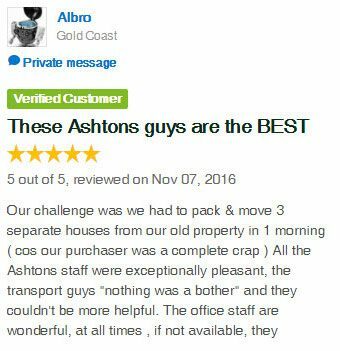 I really felt Ashtons gave SUPER service from the office girls to the removal guys. Would not hesitate to refer them which we already have. Absolutely the best removal team we have used anywhere in the world. I found it all very well organised. Thank you to everyone concerned. Outstanding in all areas. The pick-up/pack was done with care and attention – well done. The delivery was also done with care. I would recommend you guys in a heartbeat. Shaun and Stephen were extremely helpful and friendly guys. They provided an efficient and speedy packing service. Overall I was very impressed. Ashtons always have provided lovely staff. They also care about the property and are always on the look out for potential hazards. Special thanks to Wilson and Mick, they made the move so easy for us. Great service all round from the initial call I made, to sorting out a quote at short notice. Thanks to all at Ashtons. I found Shaun and Alan most helpful. We felt they supported us and took care of our precious during this move. I would have no hesitation in recommending the team. All three guys that were with the truck courteous and professional. 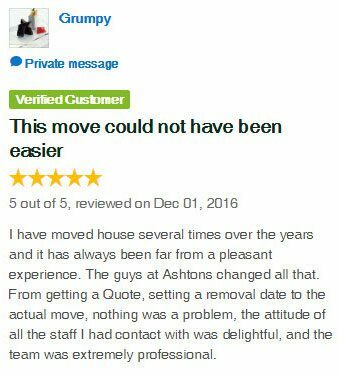 Once again, we have been more than satisfied with Ashtons’ service….extremely helpful and very professional. Many thanks! The three men worked fast, were friendly and polite. It was a pleasant moving experience. Very good to get a good removalist company. 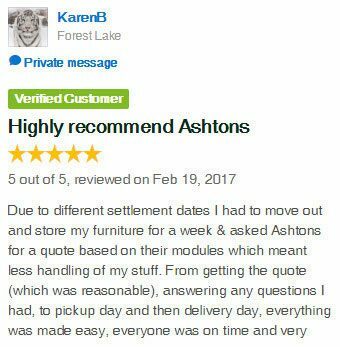 All employees whom delivered our furniture from Ashtons were so polite and efficient – good work…will recommend company. The guys were all cheerful, helpful, efficient and hardworking. The teams that moved us were all very happy and helpful guys. They were very careful with our things and considerate about where everything was put. We were very happy with the entire process and would recommend. We both agree your service to be very professional, instilling confidence at a difficult time. 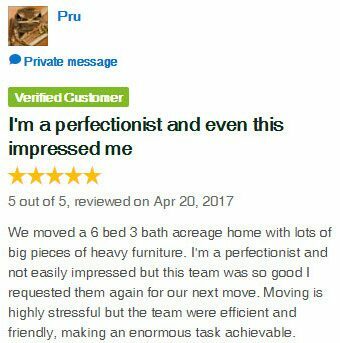 Your team of removalists did efficient and friendly service. We appreciated the demeanour of all your staff. Thank you. The whole operation went very smoothly – a very professional job. Congratulations on your systems and on your staff – office and removers. Your team was amazing on the day of the move. Nothing was too much trouble and they dealt with a number of very challenging issues. They were all consistently pleasant, helpful and quite skilful. They were on time and showed a positive, helpful and caring attitude the whole time. It was an extremely hot day and I had some heavy items which needed to be lifted into tight spaces. They didn’t hesitate and made sure everything was ok before leaving. Great service – thank again!! Would recommend you guys to anyone. 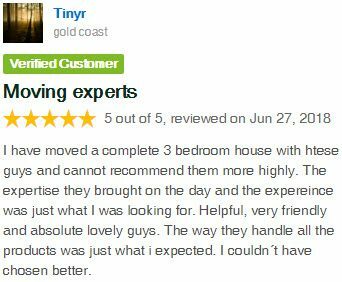 We have moved twice with you in the last 12 months and I find everything exceptional and the guys were great. These guys were awesome, polite, friendly, professional and careful. Would recommend them to anyone.